Leading Wholesale Trader of soil testing kit and soil ph & moisture meter with long probe from Mumbai. Our clients can avail from us a wide range of Soil Testing Kit, used for testing pH, Conductivity, Temperature, DO, TDS & salinity of the soil. 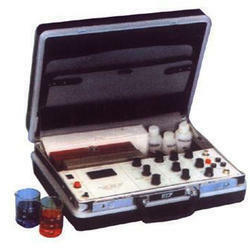 Our range of Soil Testing Kit is widely demanded for precise readings and accurate results. Further, these are sourced from recognized manufacturers of the industry and confirms on international quality parameters. 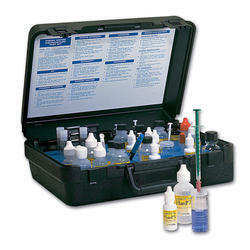 Chlorine Test Kit For determination of Residual Chlorine in water, Range : 0.1 to 5.0 PPM. Great For Quick ph & Moisture Reference of : Commercial Vineyards, Orchards, Field Produce, Nursery Planters, Lawn Maintainace Residential, Gardens, Planters. Notes :-Soil pH value is a very important factor in the production of quality crops. Most crops cannot survive in soil that is too acid or too alkaline. Therefore the correct pH reading is essential to achieve optimum results. Accuracy: ±0.2 pH-Suitable for agricultural field and classroom experiments. Calibration: Remove oxidation from meal rings by light polishing. tamping down the surrounding soil so that it adheres closely to the meters metallic electrode surface. 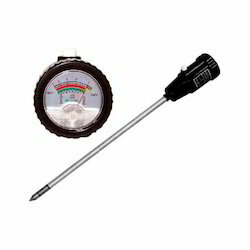 About ten minutes after inserting the meter in the soil, the pointer will indicate the correct value of pH or moisture. The meter may sometimes register different values depending on the soil condition, adhesion to the meters metallic surface, moisture content, etc. Therefore it is advised you take an average of several measurements. After use, wipe the plates clean of soil or moisture. Soften the soil in the spot to be tested. Never force of jab meter into hard earth. Do not leave the metal part of the tester in the soil for too long (no longer than one hour) or it will damage the metallic surface.Make sure the metallic surface is clean and dry before storing.Do not measure liquids. This tester is not designed for measuring liquid. If liquids enter the unit and contact the circuitry, damage can occur which will not be covered by the guarantee. Looking for Soil Testing Kit ?